I have a secret. I have been trying to resist something for a long time, and it turns out that I can't. I give up. Uncle. I am obsessed with SpillyJane and her mittens. I can't stop thinking about them and it's been going on for months. There. I've just said it. I am so obsessed that I actually think of her name in all caps, because it's that exciting to me. I don't know what hold this woman has over me, but I've been fighting for some sort of emotional upper hand for months. I thought it might go away when I met her back when I went to Detroit, but it turned out she seemed nice and that only made it worse. If she'd have been a raving, bitchy lunatic I might have gotten though this. For a good long time now, she's been putting up mitten patterns that charm the snot out of me, and I can't stop thinking about them. It's like thinking about SpillyJane mittens has become a bizarre hiccough. I go up to the stash and think "What should I make?" and some tiny Pro-Jane voice in the back of my mind squeals SPILLYJANEMITTENS! and then I sigh and think "Shut up. You always say that. Branch out, and stop putting an exclamation mark on her name." Then the next time I'm up there pondering, my mind says "How about Ribbon Mittens. No? Maybe Cupcake Mittens. Or Strawberry Mittens. Or Gnome Mittens. 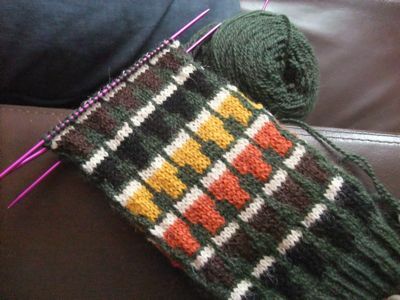 This has been going on for some time, and I have had the self control it has required to knit other things, although I have been buying a lot of mitten yarn to take the edge off. Then, SPILLYJANE! did something so completely underhanded that I knew it was over. Just over. I admitted I was helpless. I understood that she was a power greater than myself, and I gave up. The woman designed beer mittens. Well played, SpillyJane. Well played.